Earlier this month, we reflected on all the things we’ve done this past year for our customers and music fans everywhere. Our marketing director was kind enough to pop by and talk about these efforts in this post entitled, “2008: Highlights from Musicnotes.com. We’ve also took a look at what your favorite songs were from 2008, and found some interesting examples of how great songs are truly timeless. In addition to all the things we strive to do for you, our customers and fans of music, we also support the songwriter whenever we can. To this end, we started seeking out songwriter interviews so you could learn a little bit more about what goes into creating wonderful music. We’d like to take this opportunity to share with you a little more about the event we visit each fall in Nashville, Tennessee. The Nashville Songwriters Hall of Fame hosts a fantastic dinner to help usher in the inductees nominated each year. This is a very powerful ceremony for a lot of people, because the Nashville Songwriter’s Hall of Fame recognizes the beauty of music on a very emotional and in-depth level. An honor for any songwriter, Musicnotes.com is thrilled to be at this event held typically in the fall. 2008 was a momentous year for famed songwriters Matraca Berg, Tom Shapiro and John Hiatt. We’d like to share with you some of our memories from this occasion. On Saturday night, before the big event, we visited the legendary Bluebird Cafe in Nashville. Fred Knobloch was playing with Don Schlitz (who wrote the songs, “When you Say Nothing At All” and “The Gambler”), along with fellow songwriter Tom Schuyler and musician Jelly Roll Johnson (who’s a killer harmonica player). This was a great start to get Musicnotes in the mood for Sunday’s event, because these singer-songwriters have been playing together at the Bluebird for over 15 years. They basically started a musical format called “in the round,” and their music continues to delight every year. 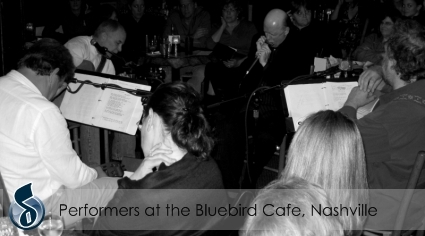 The intimate Bluebird Cafe is a perfect spot for tourists and music lovers everywhere, and has hosted hundreds of big names in music including: Vince Gill, Amy Grant, Kris Kristofferson, T-Bone Burnett, Lucinda Williams, the late Townes Van Zandt, Carole King, the Dixie Chicks and countless others. We can’t even begin to imagine what it might be like to not only write a song, but have it be so powerful that today’s top performers share the beauty of them with your friends, loved ones and peers. Pictured at left is songwriter Casey Beathard. 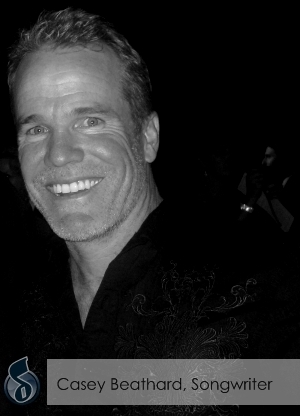 2008 was a very special year for Casey because he was selected as the 2008 Songwriter of the Year. He is credited as co-author on the 008 hit songs: Cleaning This Gun (Come On In Boy), Don’t Blink, How ’Bout Them Cowgirls, and Ready, Set, Don’t Go. This award was sponsored by the Nashville Songwriters Association International (NSAI) as part of its annual Songwriter Achievement Awards. Unlike other award ceremonies that you might be familiar with, this one is particular poignant because awards are nominated by other songwriters within the community. What an honor to be nominated by your peers! 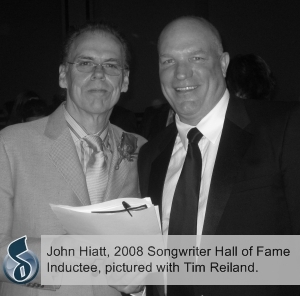 We invite you to read more about the Nashville Songwriters Hall of Fame 2008 Ceremony and hope you are inspired to create your own music and support these amazing people.